← November? What the hell? So, if a girl came home, you knew it was serious. 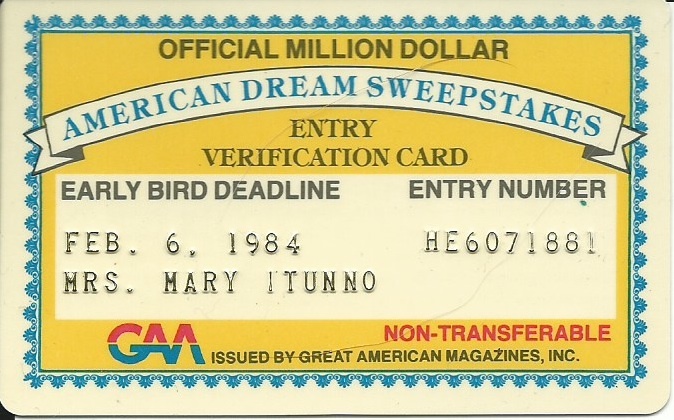 Mary ITunno’s (incorrect name again) Official Million Dollar Entry Verification Card. Yeah, right. But there was a downside to my mother liking you. Once she liked and trusted you, you became her assistant. Patty showed up on Thanksgiving; a day after Mom received something from a mail order company she didn’t like and wanted to return. And since her “dorty rotten skongs offa kids” didn’t want to write any more letters for her, she needed an assistant. She was clearing away the food and wiping down the ever-present, clear, plastic tablecloth cover (a necessity due to continual eating) and sweetly, casually said to unsuspecting Patty, “Patty honey, you ting after dinner you canna wride a for me a letter?” My sister and I both cringed, knowing what was coming. Pet Savers Sweepstakes – I have no clue what this was! Mail order was more a vocation for my mom than a convenience. It satisfied her love of contests, shopping, spending money, receiving packages and getting attention, all at once. 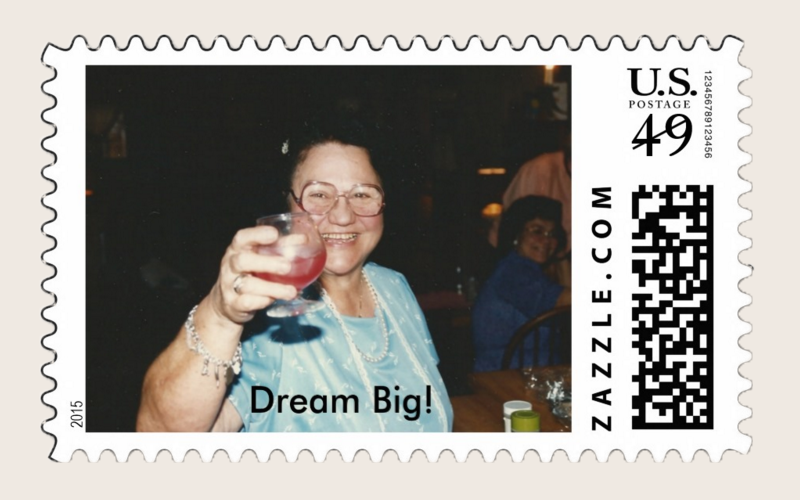 Like force-feeding, mail ordering came naturally to her, and the people at the United States Purchasing Exchange, Lillian Vernon, Lane Bryant and Spiegel (among others) knew it. Just order three items from our catalog and you’ll automatically be entered in our Million Dollar Contest! Yes, Mary Tommo, you could be the lucky winner of One Million Dollars! 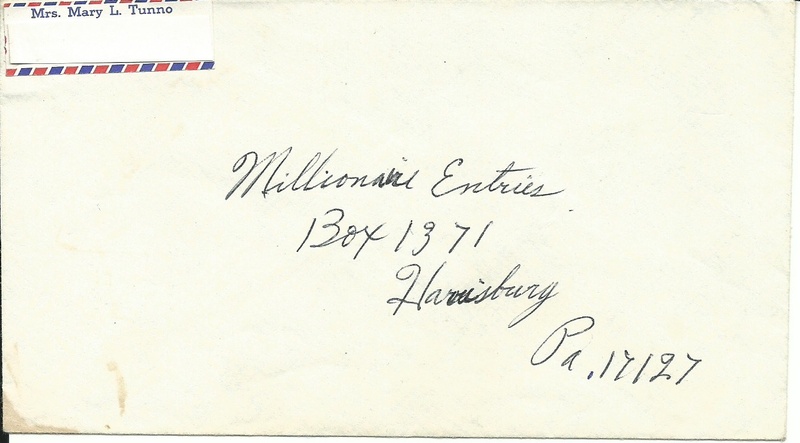 A Millionaire entry that never got sent. That simple letter was all it took. “Butta Frenzy, honey, why wood a dese a people wride a me dissa letter and tella me dis eeffa dey don’d a ting I have a chenze a to ween?” she naively asked. I tried to tell her about sales, profits, trickery and greed, but she was certain she was destined to be a millionaire and would hear none of it. She saw things in catalogs and ordered them so she could be in the contest, rarely checking their dimensions, then got angry because it looked bigger in the picture. She’d say, “Dis a stoff looked a so nize inna da book, and when I get id ittsa nading but a cheap a plastic. Since I was the youngest and most likely to be home, I was her reluctant scribe. Knowing a little something about a proper business letter, I felt her approach lacked subtlety. I tried reasonably explaining that, usually, she got exactly what she ordered, which really ticked her off. Imma pooty damn angry about a dissa lousy jong a you have send a me yesterday. I am a sending all a dis jong a back, you gypped a me and I wanna alla my money back a rite a now. There were times when none of us were around and she wrote the letters herself. I can imagine the people at the mail order companies saying, “Hey everybody, take a break, we just got a letter from Mary Tunno, it’s a classic! The entertainment value probably made it tempting to sabotage her order just to get a handwritten masterpiece. We tried to steer poor Patty away from Mom once we realized what she was up to, but it was too late. “You kids a shut uppa, eef a Patty wands a help a me, let her helppa.” My brothers, like good Italian males, were probably asleep on the living room couches, leaving a wife and a date defenseless. My sister and I slipped away and gave our thanks that mom had a new victim. At least Patty knew what she was in for when she married into the family. Here’s Mom’s turkey stuffing recipe I promised last week. Saute the onion in a pan with the ground meat. Take the bread and cut it into cubes. Place it in a medium sauce pan. Pour the milk in with the bread, heat it over medium heat and stir until the break becomes almost creamy. Set aside. Place chopped onion and ground beef in frying pan and cook until beef cooks through. Drain grease and set aside. In a separate pan, sauté mushrooms and olive oil until browned and add them to ground meat mixture. Add bread and milk mixture, then add chopped parsley, cheese, salt and pepper to taste, and mix well. This entry was posted in Uncategorized and tagged Fran Tunno, funny, hilarious, humor, Italian, Italian humor, mail order, Mary Tunno, mom, mother, story, Thanksgiving. Bookmark the permalink. You make us all just love your mom, Fran (kinda of like we all just love you!). Oh Linda…I love you right back! Thank you Joann. Somewhere my mom is either laughing or ready to skin me alive. Glad you remember her so fondly, I do too. Grandma (as we called her) was such a character, larger than life, and you capture her “voice” perfectly. Somehow when she said things like “dirty rotten skongs (translation: skunks) of daughters,” she sounded so cute. Can you imagine how “trilled” she would be to know she is now “blog famous” and your writing muse? Oh Donna, thank you so much! I think she would have loved the attention. I write it all with love and I do truly miss her. Thank you for making me feel so good about my blogging addiction. i so Love your stories, Frenzie! English is my folks second language as well, and my heart just smiles to imagine all this, even as i recall my own growing up. Like Nicol, i can hear your Mama’s voice when i read it. Thank you for sharing, my beautiful, extraordinarily gifted friend! Thank YOU for reading Matilda and for always taking the time to comment. It means so much to me that you do. Funny & right on target but I just can’t help but hear her say, “Ma Franzie, whada you magin these people ting ofa me, you lilla stronsella.” Ahhhh Fran, . . . . . .tsk, tsk, . . . LOL! Well, the good news is she’s not here to hit me on the head! I think she’d love the attention. Fran, I remember that Thanksgiving weekend so well. The first time meeting “the parents”! I was just days from turning 21 years old, and hoping to make a good impression. Who knew that all I had to do was write a few “edited” letters on her behalf, from a disgruntled customer. As I wrote them her dorty rotten skongs of daughters snickered and disappeared into the woodwork!! Thanks for posting this story on your blog. I am touched that you shared this memory, it’s priceless! I just remember you being fun, goofy and my kind of person…in addition to being able to take dictation. Very important. So glad you stuck around! I actually pictured this letter being written in my head ,very funny. Thank you Sherrie! And Thank you Colleen! So happy to have you as a reader and I always love hearing from followers, so always feel free to comment! Thank you Sherrie! Welcome, I hope you enjoy it! Happy Thanksgiving. Thank you. The same to you and your family. Kimberly, Jerry and Nicol, I could not love you each more if I tried. Thanks for always reading and making my day/week/month/year! Frenzie, I love waking up and having a great laugh and a terrific story to start my day! The sound of your mom’s voice is always so clear in my head, and so is yours, every time I read. Love you, Fran and very thankful for YOU! Thank you Jerry! Happy Thanksgiving! Sweet Nicol, my honorary little sister, thank you so much for always reading and for such wonderful responses! Can’t wait to see you! Happy Thanksgiving! Thank you for always reading Kimmers. I really appreciate the support! Have a wonderful Thanksgiving!